12 month payment plans for student tuition will begin in June. All of our tuition is managed and paid through FACTS tuition services. Click the logo below to login to FACTS. 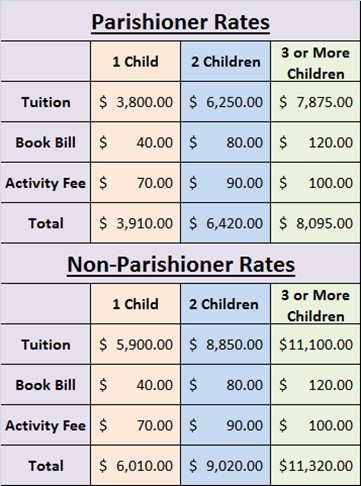 There are a number of financial assistance programs available to Saint Joseph School families. Please contact the school office for more information and applications. Below is more information regarding our popular Neumann Scholarship Foundation. The Diocese of Harrisburg, in response to the Pennsylvania Educational Improvement Tax Credit Law (EITC/OSTC), created the Neumann Scholarship Foundation. The EITC/OSTC program provides tax credits to businesses that contribute to qualified scholarship organizations. The Neumann Scholarship Foundation has been approved by the State of Pennsylvania as a qualified scholarship organization. All scholarships offered by the Foundation are provided in accord with the laws governing this program. Scholarships are offered to qualified students attending Catholic schools in the Diocese of Harrisburg, on a basis of need. In order to meet the state requirements, the scholarship organizations must demonstrate that families meet the state eligibility requirements. The Neumann Scholarship Foundation has contracted with FACTS to process the information provided by families applying for scholarships. FACTS will provide the Neumann Scholarship Foundation with a relative ranking of need among the eligible families. The Foundation will award scholarships on the basis of this information. Scholarships are available for grades Pre-Kindergarten to 12. Using the questions and criteria below, you can determine if you meet the requirements of the State of Pennsylvania, and the Neumann Scholarship Foundation. 1. Are you a resident of Pennsylvania? Scholarships are available to residents only. 2. Is your child attending or accepted to attend a Catholic School in the diocese? 3. Does your household income fall below the state guideline for maximum income? Parents/Guardians maximum combined income: $76,350. Income limit increases $15,270 for each additional dependent of the household. If any other member of the household files a Pennsylvania tax form, that income must be included in your calculation of household income. For example, parents combined taxable earnings are $65,000. There are two dependent children in the household. One is a high school student with a part time job, who earned $5,000. Household income is actually $70,000. However, the family’s income limit for eligibility is $106,890 ($76,350 + $15,270 for each child). The family would meet the state eligibility guideline for a scholarship. May I apply for more than one EITC scholarship? Yes. There may be more than one organization offering partial scholarships in your area. The total amount of scholarship assistance you receive through the EITC/OSTC program may not exceed the tuition that your family is responsible for. 1. If you determine that you may be eligible for a scholarship, applications are available on-line. Please login to your FACTS account to submit the form. IT MUST BE SUBMITTED ONLINE. 2. One application is used per family, even if students attend different Catholic schools in the diocese. 3. Please fill in all forms carefully and attach the required documents. Federal tax forms may be required. 4. Applications are entered to FACTS by on-line application only. 5. A $30 Fee must be included with the application.